This is the inaugural post of the relaunch of OOTG. Those that have heard my sermons on making pitches or anything I have ever said about value proposition will know how important the iPod is to me as an example of a great product. It is fitting I launch this journal with a tribute to what for me may be the greatest product of all time. I have owned 4 iPods. My last one is a generation 5 and the audio quit working. Plus, it ONLY holds 64 GB and I have nearly 80 GB of music in iTunes. As Steve Jobs put would it, I can no longer put my musical library in my pocket. So I had planned to get a new one for Christmas: G6 Classic – 160 GB. That would hold me for a while. Three days ago, I saw a blog post that Apple was discontinuing the iPod Classic. So I went out at lunch to pick one up at the local BestBuy. There were none in the locked cabinet and the sales guy was confused because “they were there yesterday”. After a few minutes he explained that he could order one in a week. No need, I can do that. Amazon was already selling them at 60% over list. Something was wrong! As I was reveling in the fact that I had the very last iPod in Knoxville, it hit me that the original release of the iPod was in the fall of 2001, October 23 to be exact. Thirteen years was a pretty good run for a cutting edge product that changed the world. It’s that point I wish to commemorate in this post. I have a peculiar love affair with the iPod because it serves as the object lesson for so many snippets of entrepreneurship education. Minimally Viable Product – The iPod was not the first digital music player and it was arguably not the best. Sony owned the market with the Walkman. The mechanical scroll wheel didn’t work very well. The battery didn’t last and you couldn’t replace it. It only worked with Firewire and the Windows version of iTunes wasn’t released for another 9 months. It had 2 things. First, it had a hard drive memory which let you put “!,000 songs in your pocket.” Second, it was beautiful. The ear buds were white. You could see a person way down the concourse in the airport with white wires coming out of her head and you knew, “…that chick has an iPod. She’s cool!” Within two years, Apple owned 90% of the market in hard drive players and 70% of the total market for MP3 players. TWO YEARS!!! Forerunner of the Smartphone – No one can argue the impact of the smartphone on our society. It has changed everything. And the iPod Touch was the launch pad for the iPhone. They were both released in 2007 with mostly identical hardware and operating systems. The iPod functionality has been a part of the iPhone ever since, although to my disappointment, limited storage (hence my need for 160 GB Classic). Perfect Pitch – Anytime I teach techniques on making a funding pitch, I always start with the YouTube video of Steve Jobs’ release of the iPod in 2001. It has most if not all of the essential elements of an effective presentation… for ANYTHING, but specifically an entrepreneurial funding pitch: Story telling, problem/solution, competitive landscape, simplicity, understated passion, building to the climax of the story, and so on. I’m going to have to update all my presentations. 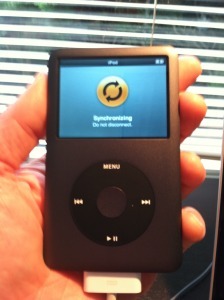 Pretty soon, the college kids won’t know what an iPod is and I’ll look more like the old guy I really am. Old hip products by definition, can’t be hip. But it’s going to be hard because there is nothing else like it and there may never be again. A product that changed the world. So now as I finish up this post on my MacBook Pro, listening to the Eagles Desperado album on my new but obsolete iPod 6G Classic, I am contemplating getting the new iPhone 6 next week. In a few minutes, I’m going to go upstairs and check Twitter on my iPad. I am unapologetic and proudly all-in Apple. Thanks Steve, wherever you are, for sending us a great experience!